Israeli soldiers injured, Friday, a Palestinian journalist working for a French media agency, and caused many Palestinians to suffer the effects of teargas inhalation, after the army resorted to the excessive use of force against the protesters, participating in the weekly procession against the illegal Annexation Wall and colonies. Morad Eshteiwi, the coordinator of the Popular Committee against the Annexation Wall and Colonies in Kufur Qaddoum, said dozens of soldiers invaded the town, before breaking into homes, and occupied several rooftops to use them as firing posts. He added that the soldiers fired many live rounds, gas bombs, concussion grenades and rubber-coated steel bullets at random while suppressing the procession. One journalist, identified as Ja’far Eshteyya, was shot with a gas bomb in his leg, while dozens of Palestinians suffered the effects of teargas inhalation. Many Palestinian youngsters hurled stones at the soldiers after uncovering an ambush by the army, where the soldiers hid to abduct the protesters, while others photographed them. 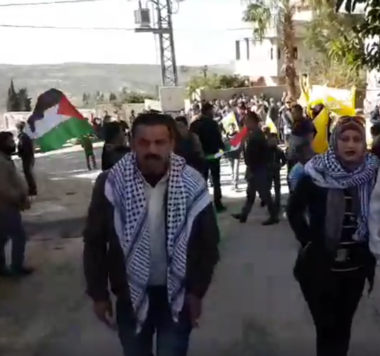 It is worth mentioning that the protesters also marched in solidarity with ailing detainee, Ragheb Abu Diak, a cancer patient imprisoned by Israel and facing a deterioration health condition. The protesters chanted for the release of all detainees, the liberation of Palestine, and for establishing a sovereign and independent Palestinian State, with East Jerusalem as its capital.